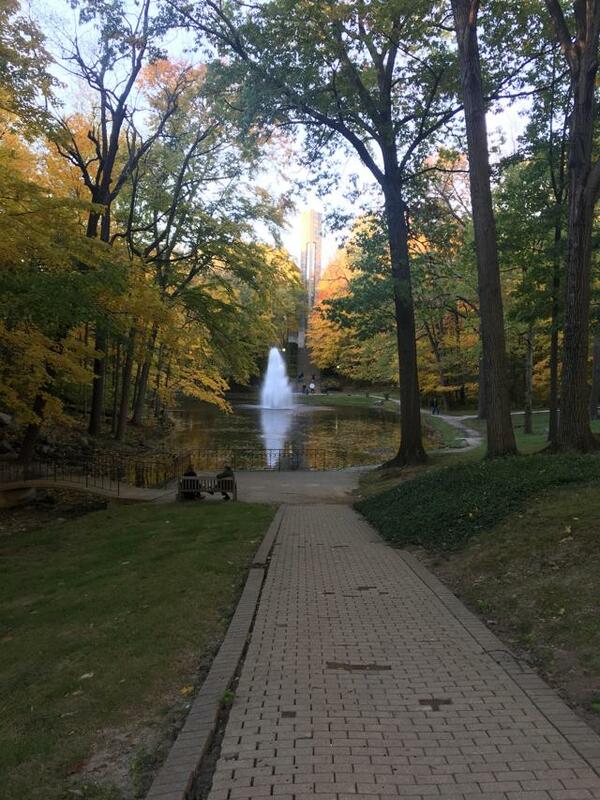 October 2018 was an eventful, volatile month. Remember, volatility is opportunity, even though this opportunity is not easy. This is a post to chronicle some of the price action, and to take inventory of where we stand. We will look at monthly charts with this update. There are some big picture moves developing that become clearer when looking at the monthly charts. "A 60:40 allocation to passive long-only equities and bonds has been a great proposition for the last 35 years …We are profoundly worried that this could be a risky allocation over the next 10." "Life and investing are long ballgames." The month of October has a long venerable history in the U.S. stock market, and that tradition continued with October of 2018. The trends emerging in this most recent October, particularly the under-performance of the Invesco QQQ Trust (QQQ), which lost -8.6% for the month, and the price strength in natural gas (UNG), which saw natural gas prices rise 8.4% in October when nearly everything else declined, have generally carried through to November, as we appear to be at a major inflection point in the bond, stock, and commodity markets. As a normal part of the research process, I catalog a selection of monthly charts, and the price action offers important clues. With this article, which was originally authored in early November for members of The Contrarian, yet I still believe it has valuable insights today, including updated notes on price action in November, we are going to go through a highlighted portion of these selected market barometers, with a couple of comments. To make it interesting, I am going to organize these selected barometers by year-to-date performance, from top to bottom. 1. Still in first place, through October month-end, in terms of YTD performance is $BRENT oil, which fell -8.8% during the month of October, as the chart below shows, yet is still up 12.9% YTD (Author's Note: This has changed dramatically two weeks and a few days into November as $Brent oil is now up only 0.7% through Friday, November 16th). 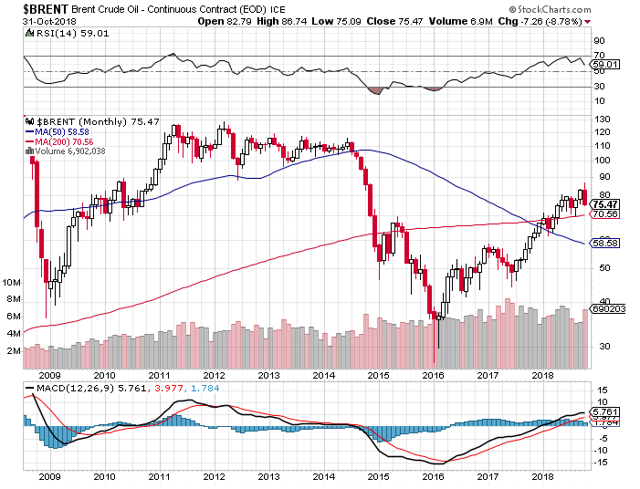 Looking at the monthly chart above, the longer-term technical price action of $BRENT looks healthy, although it appears a pullback could be under way (Author's Note: Brent oil closed at $67.32 on Friday, November 16th). 2. Next, in-terms of performance is $NATGAS, as somewhat quietly, natural gas prices (UNG) are now higher by 10.4% YTD in 2018, after a 8.4% gain in the month of October, when almost everything else went lower (Author's Note: Natural gas prices have continued their surge and are now higher by 44.7% YTD through Friday, November 16th). Looking at the monthly chart above, natural gas has finished higher 6 of the past 8 months (Author's Note: November would make 7 of 9 if natural gas can hold its gains), and natural gas looks like it is just beginning its move higher, from my perspective. To add to the narrative, natural gas equities like Cabot Oil & Gas (COG), the blue-chip of Appalachia producers, and Southwestern Energy (SWN), which remains my top buy-and-hold idea for the next decade, finished higher by 7.6%, and 4.5% respectively for the month of October, showing both absolute and relative strength. This relative, and absolute price strength for natural gas prices, COG, and SWN, occurred in a month where Amazon (AMZN), perhaps the leading stock of the bull market dating to March of 2009, saw its shares decline -20.2%. 3. Third, in-terms of YTD performance through the end of October is the Invesco QQQ Trust, which is higher by 9.6% YTD, even after its 8.6% decline for the month of October (Author's Note: QQQ is down modestly in November, with its YTD return through Friday, November 16th, now standing at 8.2%). 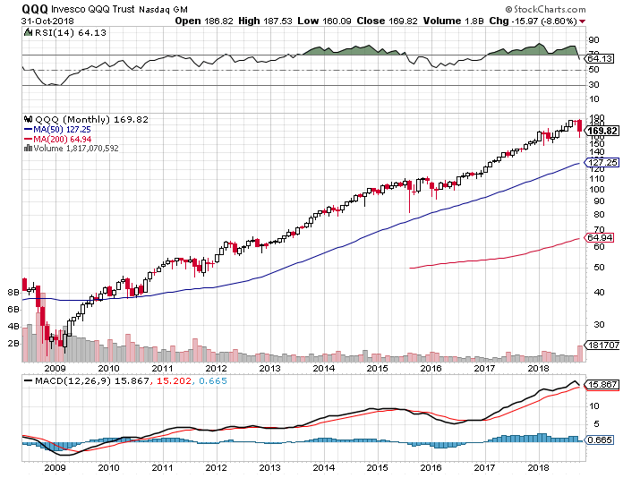 Looking at the monthly chart above, it has been a pretty amazing run for the triple Q's, including a five-year stretch of mostly being overbought. 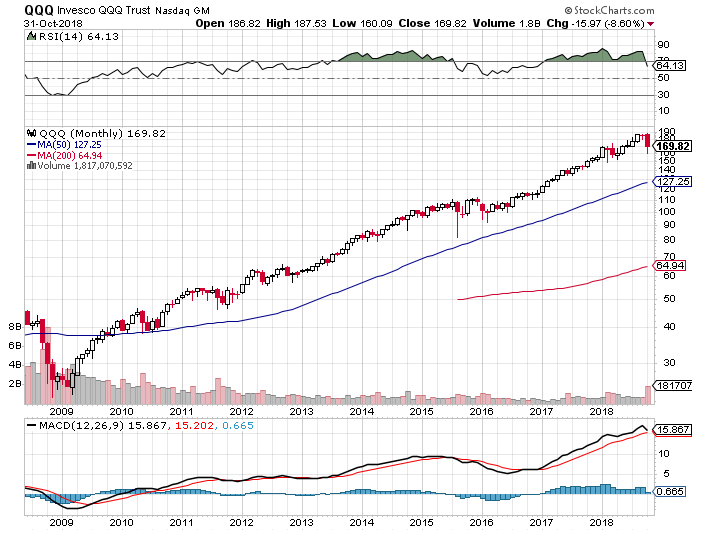 Even with the recent pullback, QQQ still looks extended, and if there were ever a true market correction, or rotation, there is a lot of downside room for QQQ on the monthly chart (Author's Note: Are we staring to see this with the unwind of former favorites like NVIDIA (NVDA)?). 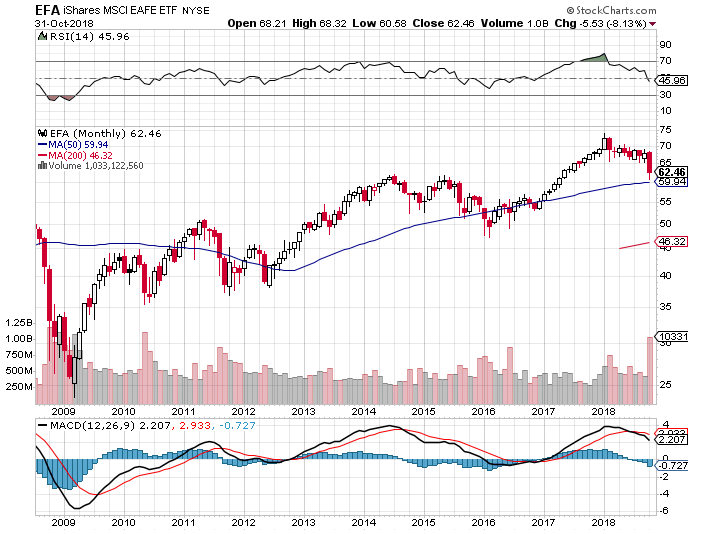 Going further, QQQ could pull back sharply, and there is a lot of room to decline before longer-term technical damage is done. 4. Next in the YTD performance rankings of our selected barometers, is $WTIC oil (USO), which is up 8.1% YTD through the end of October, even after a steep -10.8% monthly decline in October (Author's Note: As of Friday, November 16th, $WTIC oil is now down -6.2% YTD). For the record, $WTIC oil finished lower by -2.5% yesterday, the first trading day of November. $WTIC has lagged $BRENT oil, as U.S. production surges, so it will be interesting to monitor the divergence of $WTIC and $BRENT going forward. 5. The U.S. Dollar Index has returned 5.5% through the end of October, placing it in fifth place on the list (Author's Note: The $USD Index is now higher by 4.9% through Friday, November 16th, so the Dollar Index has actually declined moderately in November). 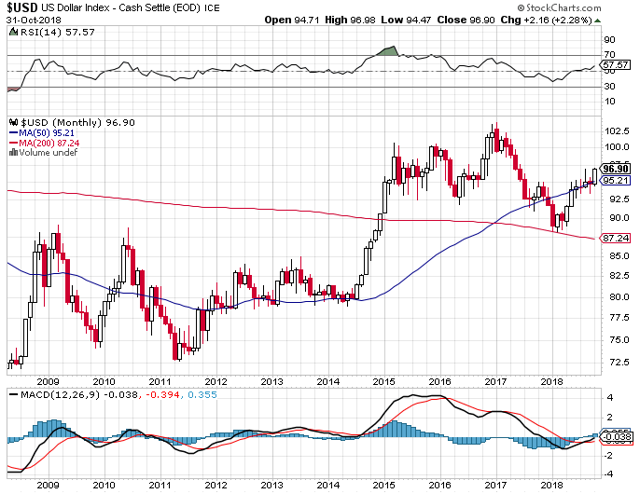 The monthly chart of the Dollar Index shown above, shows strength in 2018, with potentially more room to go. Time will tell, however, bigger picture, the U.S. Dollar Index has remained materially below its 2015-2017 highs, even with all of the Dollar positive developments, so this divergence is suggesting a longer-term move lower in the Dollar, at least from the bigger picture perspective. 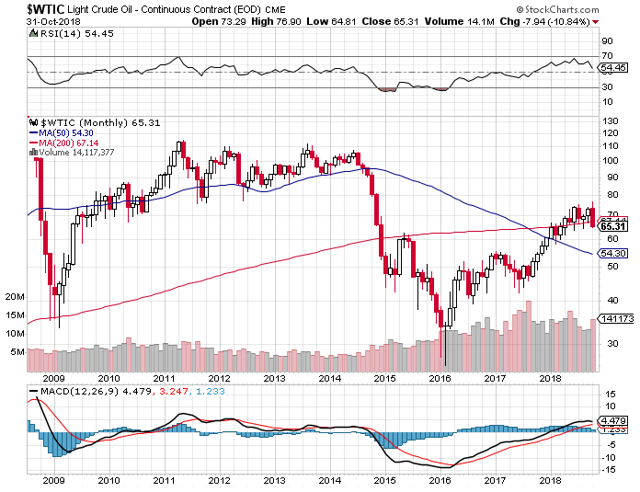 If this happens, this could be a boost for commodities, commodity stocks, and international equities. 6. The venerable Dow Jones Industrial Average (DIA), which finished October down -4.9% for the month of October, is next on the list. Even with the decline in October, the DIA is still up 3.2% for the year through Wednesday, October 31st, 2018 (Author's Note: The DIA is up 4.6% YTD through Friday, November 16th, so the Dow Jones Industrial Average us up modestly in the month of November). 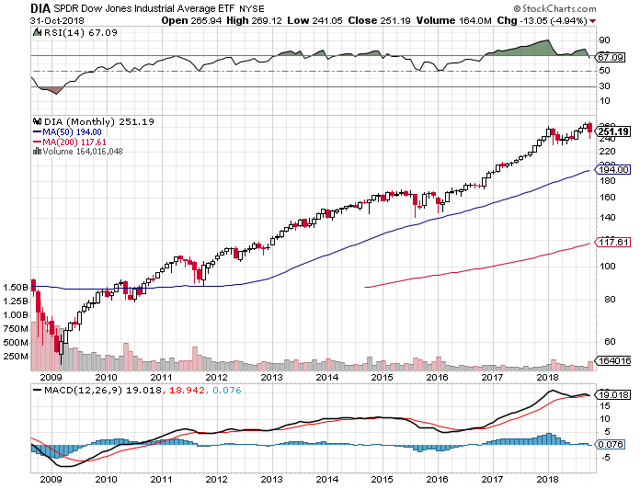 Similar to the QQQ's, it has been an incredible run, collectively, for the 30 Dow Jones Industrial Average companies, and collectively, they remain extended on longer-term charts, even after their sharp pull-back in October. 7. The S&P 500 Index (SPY) slots in seventh place in the rankings of my selected barometers, with a YTD return of 2.7% through the end of October (Author's Note: SPY is up 3.9% YTD through Friday, November, 16th, so the S&P 500 Index has also risen modestly in the month of November). 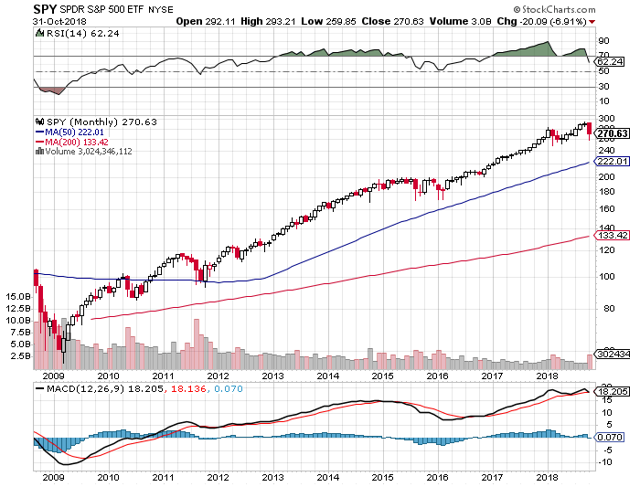 Similar to the Dow Jones Industrial Average, and the QQQ's, the S&P 500 Index has been on a record run, and despite the pull-back in October, which was a sharp -6.9% decline, there is plenty of room to move lower on a monthly chart. That is the glass half-empty view. The glass half-full view would be that the long-term technicals still look constructive, and there needs to be a severe price dislocation to change that view. 8. For my selected this of barometers, that ends the positive performance in 2018 through October month-end, with almost everything else I watch, from a broad market perspective, in negative territory YTD. The least negative is the $CRB Index, which is a basket of commodity prices (DBC), (GSG), (DJP), as the $CRB is down -1.5% on the year after October's monthly drop of -2.2% (Author's Note: Despite the price strength of natural gas in November, which is only a small part of the $CRB Index, the $CRB Index is now down -3.4% YTD through Friday, November 16th, so the $CRB Index has declined moderately in the month of November, dragged lower by the severe decline in oil prices). 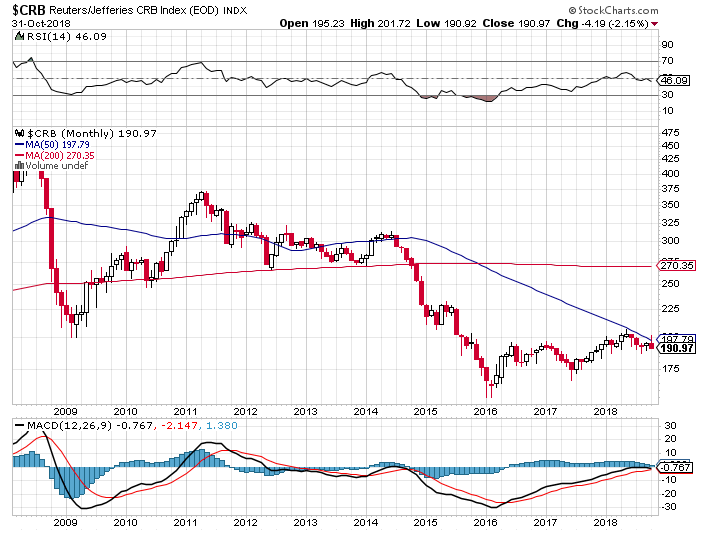 Looking at the monthly chart above, the $CRB Index has struggled the past five months, after a strong run dating to the middle of 2016, somewhat mirroring the price action of emerging market equities. Even though October's performance was difficult, with the aforementioned loss of -2.2%, the $CRB Index still materially outperformed the major market indexes in October (QQQ down -8.6%, SPY down -6.9%, and DIA down -4.9%), and this occurred even with the stronger U.S. Dollar (up 2.3% for the month), so perhaps the burgeoning relative strength is a positive sign for near-term performance? Time will tell, however, there is not question that commodity prices are historically undervalued versus equity prices. 9. 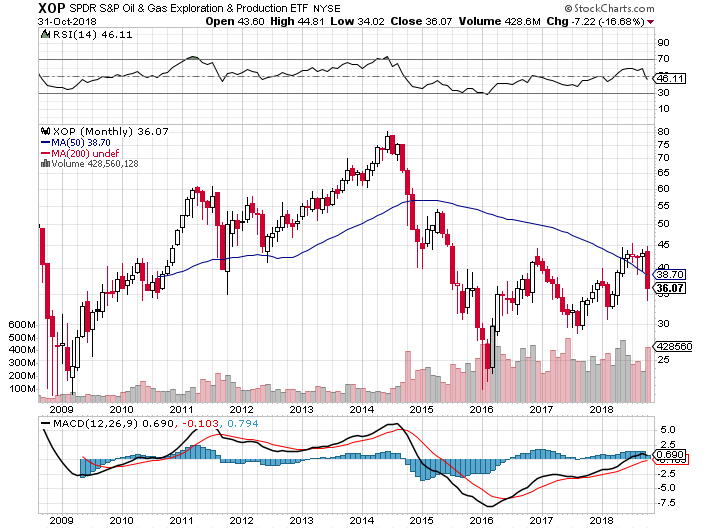 Next up, is the SPDR S&P Oil & Gas E&P ETF (XOP), which captures the relatively smaller exploration & production companies. This ETF was down -2.5% YTD through October 31st, after a brutal month of October, which saw this ETF down -16.7% (Author's Note: The SPDR S&P Oil & Gas ETF continued its price declines in November, and XOP is now lower by -6.1% through Friday, November 16th). Obviously, the steep fall in oil prices in the month of October ($BRENT down -8.8%, and $WTIC prices down -10.8%) hurt the exploration and production stocks. However, the monthly chart above shows a series of higher highs, and higher lows, on a monthly basis, so as long as that continues, the monthly chart looks positive, from my vantage point (Author's Note: Will this pattern of higher highs and higher lows hold up in November?). 10. Somewhat surprisingly, the large-cap oil stocks, as measured by the Energy Select Sector SPDR Fund (XLE), are trailing their smaller cap brethren (XOP) YTD, with a loss of -5.1%, compared to XOP's decline of -2.5%, though this gap did close in the month of October, as XLE dropped less, though the absolute decline was still eye-opening, which was a loss of -11.3% for the month (Author's Note: XLE has help up very well with the November declines in oil prices, with XLE flat, and still down -5.1% through Friday, November 16th). Similar to XOP, the monthly chart of XLE looks constructive. However, large-cap oil equities like Exxon Mobil (XOM), Chevron (CVX), and Schlumberger (SLB) have held up much better than their smaller capitalization peers over the course of the commodity bear market from 2011-2016, so there is less appreciation potential in these equities, particularly relative to energy prices, in my opinion. 11. Not too far behind the XOP in the YTD performance rankings of my selected barometers is $GOLD (GLD), with gold prices down -7.2% YTD through October's month-end (Author's Note: Gold prices have had a modest gain in November, and they are now down -6.6% YTD through Friday, November 16th). Gold prices actually finished higher in the month of October, up 1.6%, with GLD higher by 2.1%, in a month when nearly everything declined, with the notable exception of natural gas prices, which were up 8.4% as detailed earlier. 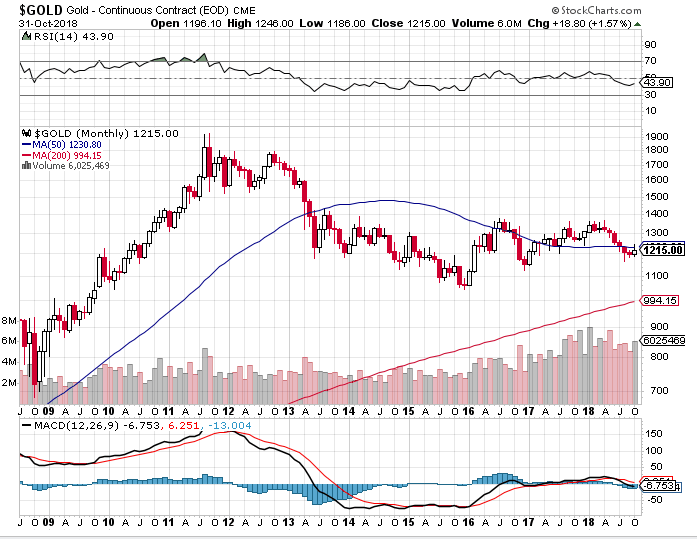 Specific to gold prices, they appear to be at a crossroads, still positive technically on longer-term monthly charts, but still in a trading range. The price action of precious metals equities, which we will get to later in these YTD performance rankings, will probably have a leading influence on precious metals prices. 12. Another surprising entry on this YTD performance list, at least its place on the list, is the iShares 20+Year Treasury Bond ETF (TLT), which is down -8.7% YTD through the end of October, including a -2.9% loss in the month of October (Author's Note: The iShares 20+Year Treasury Bond ETF (TLT) has risen modestly in November, and TLT is now down -7.6% YTD). It is pretty strange to see longer-term bond prices down, meaning yields up, in a month when the stock market sells off so sharply (QQQ down -8.6%, SPY down -6.9%, and DIA down -4.9%), yet that is what happened, and that has been the story of 2018, in my opinion. 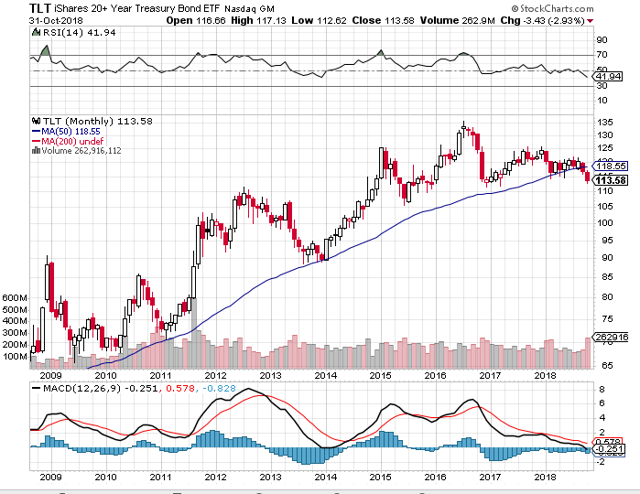 With the monthly chart of TLT above showing technical weakness, could longer-term bond yields go even higher (TLT lower)? We will find out soon enough, however, I believe the answer is a resounding yes. Overall, the price action in the bond market, is confirming that our long-term investment thesis is in-tact, specifically with regard to our bigger picture investment thesis. 13. 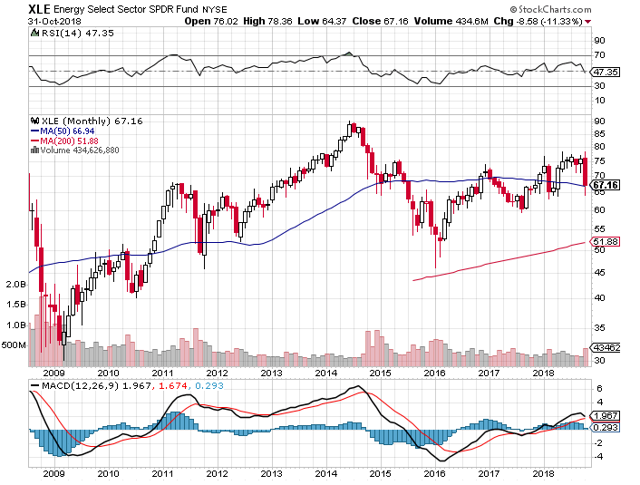 Slotting in behind the -8.7% loss YTD in TLT through the end of October, is the -9.4% loss in the iShares MSCI EAFE ETF (EFA) YTD, which lost -8.2% over the past month (Author's Note: EFA is up modestly in November, and now stands at -8.7% YTD). Price action in international developed market equities has been challenging, particularly in some of the more out-of-favor ideas, as international equities have significantly trailed their U.S. peers. Fortunately, as the monthly chart of EFA shows above, international developed market equities still have positive longer-term technicals, and EFA appears to be getting oversold on both a relative and absolute basis. 14. Following the theme of international equities being out-of-favor, the iShares China Large-Cap ETF (FXI) is down -13.8% in 2018, after falling -8.2% in the month of October (Author's Note: The iShares China Large-Cap ETF has perked up in November, and is now down -9.0% YTD through Friday, November 16th). Despite the recent struggles of FXI, the monthly chart above shows more constructive longer-term price action. 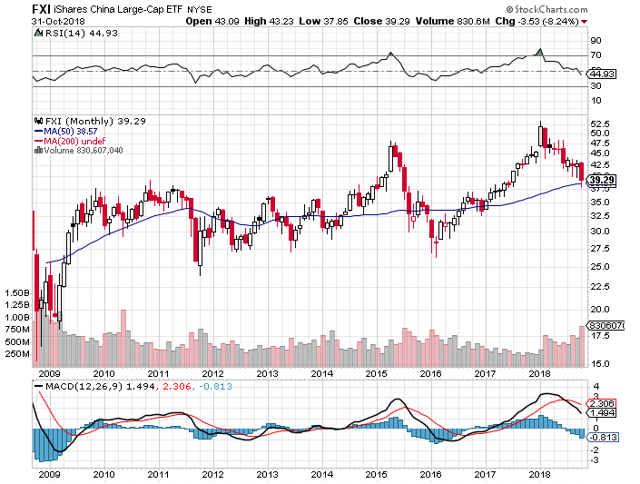 Additionally, sentiment towards emerging market equities, and Chinese equities is very negative, offering a contrarian opportunity, in my opinion, potentially in selected equities like JD.com (JD), which has been the topic of much discussion in the daily Live Chat in The Contrarian. 15. 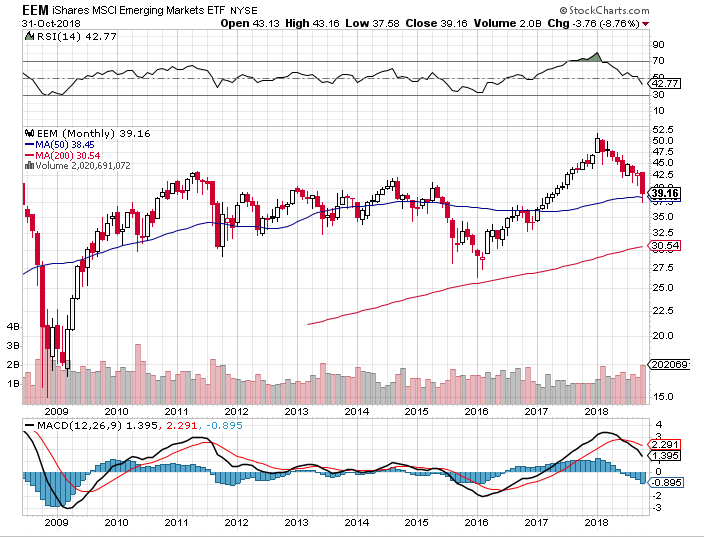 Speaking of emerging market equities, the iShares MSCI Emerging Markets ETF (EEM) has under-performed even FXI, falling -16.4% YTD, after a -8.8% declined in October (Author's Note: Similar to the iShares China Large-Cap ETF, the iShares MSCI Emerging Markets ETF has bounced back moderately in October, and is now down -12.6% YTD). Similar to FXI, the price action in EEM has been challenging recently, however, it looks constructive longer-term after an impressive move higher following its 2016 lows. From a monthly perspective, the recent declines look like a normal pullback, after a strong run, at least that is my initial conclusion. 16. Just behind the EEM decline of -16.4% YTD, is the -16.7% decline of $SILVER (SLV). Silver prices actually fell -2.9% in October, trailing the performance of gold, which finished in positive territory (Author's Note: Silver prices are up very modestly in November, roughly 0.6%). 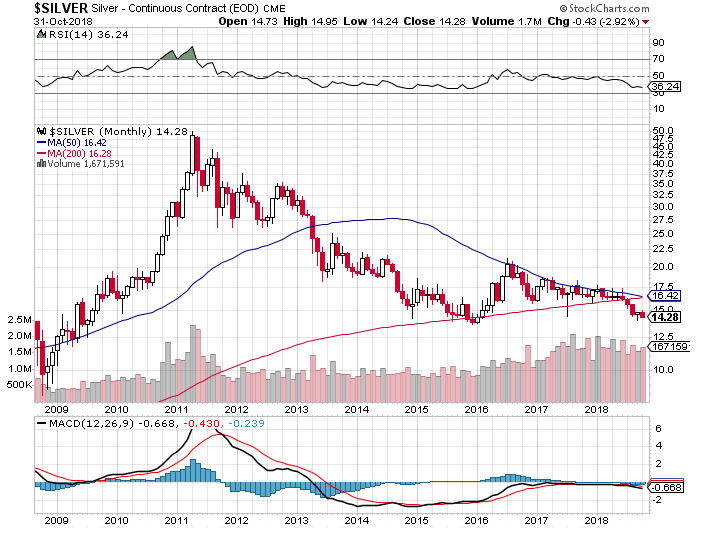 In contrast to gold, the monthly chart of silver is not as positive, with silver showing sustained weakness following its 2011 parabolic ramp, and the price of silver has recently broken through key technical levels. 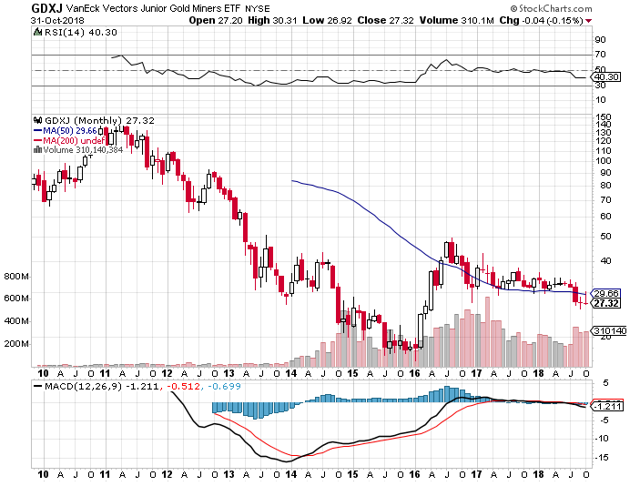 Is the recent price weakness in silver a shakeout type move? That certainly seems to be the case, as commercial positioning in silver is more favorable than is has ever been. Ultimately, it is my prediction that silver prices are going to have significant volatility in the months ahead, with the potential for a strong reversal higher, potentially in the near-term. 17. With gold and silver prices struggling year-to-date, the U.S. Dollar stronger, and real interest rates rising, though still at very low levels, and likely to remain historically accommodative, which I think is something that most investors are missing right now, it should not be a surprise that the larger-capitalization precious metals equities have struggled too. That is certainly the case as VanEck Vectors Gold Miners ETF (GDX) is down -18.6% YTD through the end of October, though it should be noted that the GDX actually rose 2.2% in October (Author's Note: GDX is up moderately in November, and is now down -16.6% YTD through Friday, November 16th). The bigger picture monthly view, shown in the GDX chart above, is more complicated, with a clear reversal, and surge higher in 2016, followed by an agonizing grind lower, over the past two years. Personally, I remain very encouraged by the recent price action in precious metals equities, particularly the price action by Barrick Gold (ABX), the fundamentally attractive largest precious metals miner once again after its merger with Rangold (GOLD). 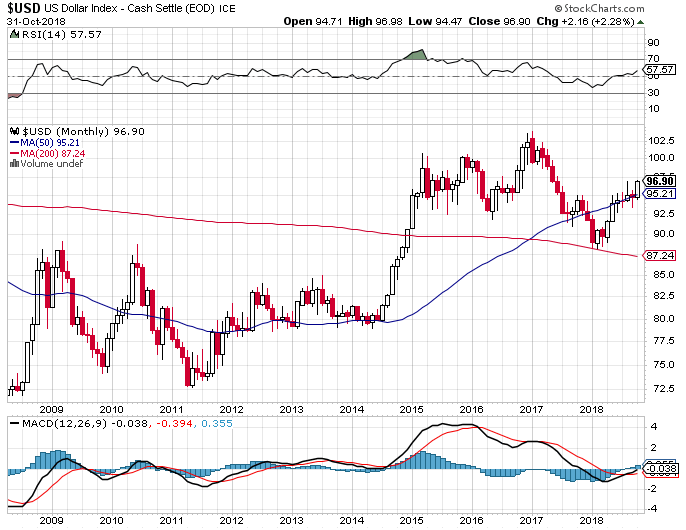 Barrick had a tremendous reversal and rebound in 2016, then declined in a water torture fashion, but recently, ABX shares have reversed sharply higher again, and are threatening to break out of a recent technical downtrend. Building on this narrative, if you look back to late 2015/early 2016, which encompassed a brutal, rolling correction in global equities, and the capitulation of commodity equities, similar to what we have just experienced, precious metals equities led the rebound. With the positive price action of ABX, and GDX, in October, and a building U.S. Dollar divergence, could the same thing be happening again? 18. As detailed above, gold prices have declined -7.2% YTD, and silver prices have declined -16.7% YTD. The price decline in copper prices trumps both, with copper prices lower by -19.4% through the end of October, after a -5.2% monthly decline in October (Author's Note: Copper prices have bounced back moderately in November, and are now down -15.2% YTD). Even though copper prices have declined more than gold or silver prices year-to-date in 2018, I think the monthly chart of copper prices paints a more telling near-term picture, with copper prices right on top of a key technical support level. Yesterday, Thursday, November 1st, copper prices bounced pretty strongly, up 2.4%, and if this bounce has legs, it could be a positive leading signal for the broader reflationary trade. 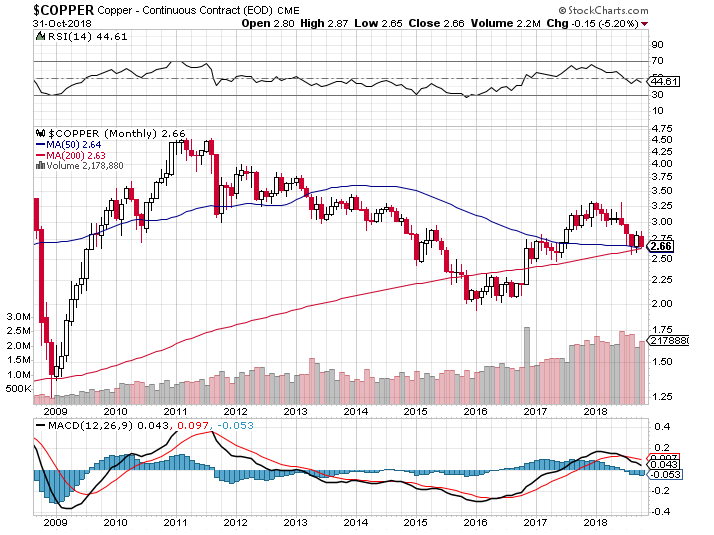 If copper prices rebound, downtrodden Freeport-McMoRan (FCX), which has had a significant decline this year, could be an intriguing rebound candidate. On the other-hand, if copper prices continue their 2018 move lower, that is a bad sign, in my opinion, though I still think there is longer-term technical support at the $2.40 level. 19. Last but not least, in my YTD performance ranking and monthly review of a selected group of market barometers, are smaller capitalization precious metals equities, as measured by the VanEck Vectors Junior Gold Miners ETF (GDXJ), which has lost -20.0% through the end of October, after a modest -0.2% loss during the month (Author's Note: GDXJ has recovered slightly in November and is the VanEck Vectors Junior Gold Miners ETF is now down -19.4% YTD). The same commentary I authored specific to the GDX, the large-cap precious metals, applies here to the GDXJ, so I will repeat it as follows. 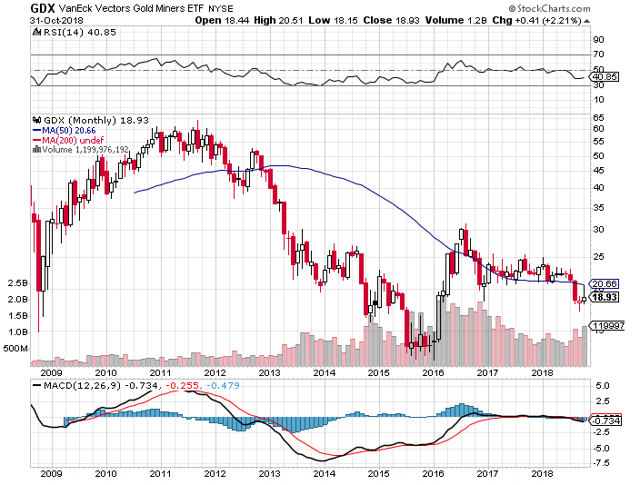 The bigger picture monthly view shown in the GDX chart above is more complicated, with a clear reversal, and surge higher in 2016, followed by an agonizing grind lower, over the past two years. Personally, I remain very encouraged by the recent price action in precious metals equities, particularly the price action by Barrick Gold, the fundamentally attractive largest precious metals miner once again after its merger with Rangold. 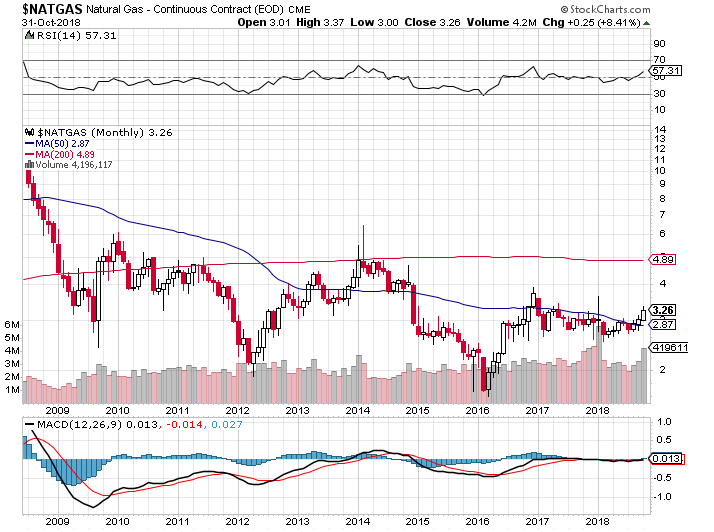 My initial thought is that the price action in October provided many clues, including the specific out-performance of natural gas, natural gas equities, precious metals, and precious metals equities, and the broader out-performance of commodities, even in a stronger U.S. Dollar environment, though the U.S. Dollar remains materially below its 2015-2017 highs, and that is an important sign too, in my opinion. Building on the narrative, and building on our bigger picture investment thesis, it was surprising to see TLT down in October, with the equity markets off as sharply as they were, which continued a downtrend in TLT (an uptrend in longer-term yields) that has persisted all year. Wrapping up, I still think we are in the midst of a multi-year inflection point, and I believe the markets are only going to get more interesting moving forward. Looking forward to hearing your thoughts and observations in the comments section below. For further perspective on how the investment landscape is changing, and for help in finding under-priced, out-of-favor equities with significant appreciation potential relative to the broader market, consider joining a unique community of contrarian, value investors that has thrived in 2016 and weathered the storm in 2017 to become closer as a collaborative team of battle tested analysts. Collectively, we make up "The Contrarian," my premium research service. Disclosure: I am/we are long ABX, COG, FCX, SWN, AND SHORT SPY AND SHORT TLT VIA PUT OPTIONS. I wrote this article myself, and it expresses my own opinions. I am not receiving compensation for it (other than from Seeking Alpha). I have no business relationship with any company whose stock is mentioned in this article.